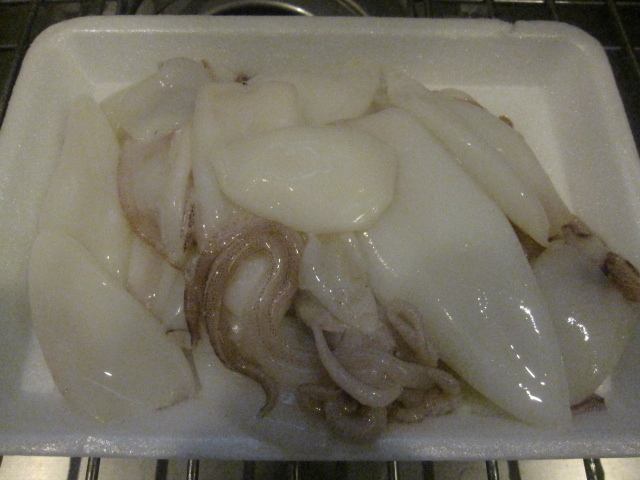 We had picked up some squid the other day, about a pound, that needed to be eaten before it went bad. I had always wanted to try stuffing squid and this seemed to be the perfect opportunity. Always the opportunist I went with it. First thing I did was make the stuffing. 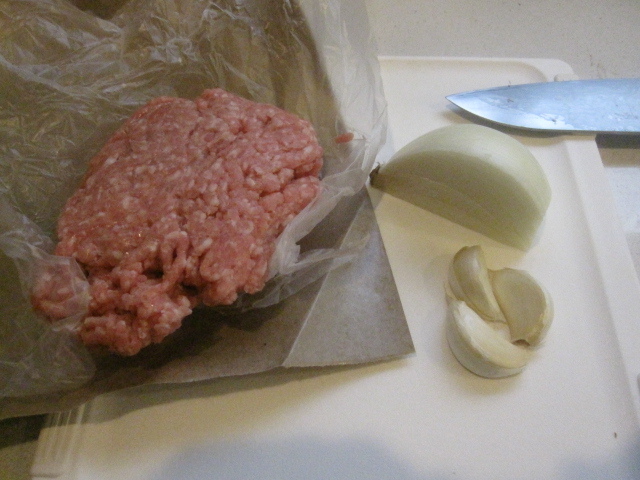 I picked up about a half pound of ground pork, a quarter onion diced, and minced 3 garlic cloves. 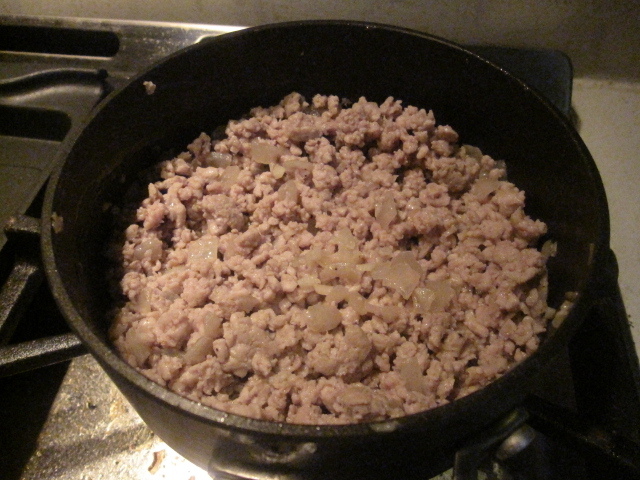 I sautéed the onion and garlic in about 2 tablespoons of olive oil for about 7 minutes and then added in the pork. Once the pork was fully cooked, about 5 more minutes, I seasoned with salt and pepper and then let it sit for a couple of hours to cool down to room temperature. After getting some work done on my computer while the stuffing was cooling down I got the spaghetti sauce ready. 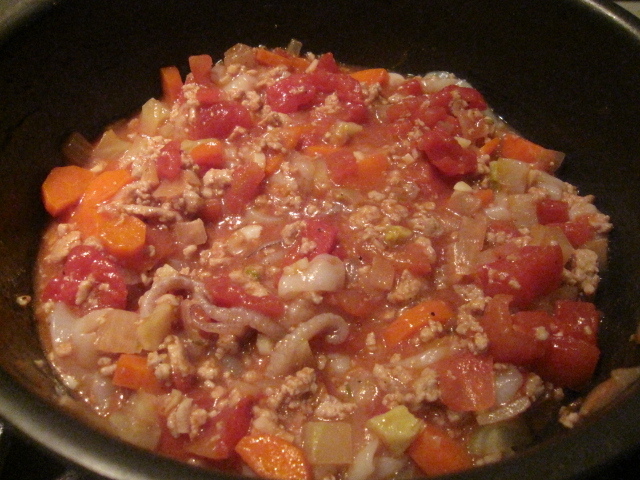 I used a half bulb of fennel (fronds saved for garnish), a carrot diced, 3 cloves of garlic minced, a quarter onion diced, 1 can of diced tomatoes, and a quarter cup of chicken stock. In my hot pan I poured in about 3 tablespoons of olive oil and then sautéed the garlic, onion, carrot, and fennel for about 10 minutes over medium-high heat. Then I poured in the chicken stock and let it boil down for about 5 minutes before adding the tomatoes. I seasoned with salt and pepper and gave it a taste. I saw the need for a little more flavor depth so I poured in about 5 to 6 tablespoons of balsamic vinegar. Here are my little squid. I threw the tentacles into the spaghetti sauce. I started stuffing the bodies with the pork mixture. That was not an easy task. None of my regular spoons were small enough to fit into the squid, my utensil is too big (I wish)! So, I tried using one of Otis’ feeding spoons. That was too big too, but did get some pork stuffed in. 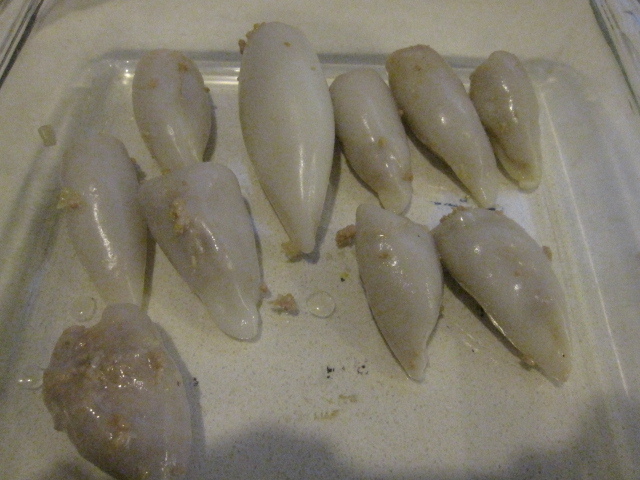 I ended up just using my fingers, still a difficult task as the squid kept slipping out of my hand. Slippery little suckers. After I got ten of the squid stuffed I realized that I was short on time and had to go pick Otis up from daycare. Since I only needed three and a half servings (dinner for all three of us and lunch for Yuki) I thought that 10 was enough. So I cut the rest of the squid into rings and tossed it into the spaghetti sauce along with the rest of the pork mixture. 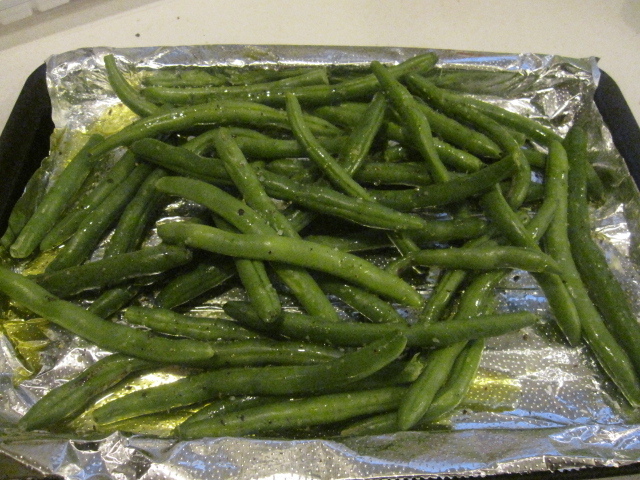 To get some green into dinner I took a big handful of haricots vert and roasted them with olive oil, salt, and pepper at 375 degrees for about 15 minutes or so. While my noodles were cooking (I really wanted black squid ink pasta, but couldn’t find any so I used spinach spaghetti and just boiled it according to package instructions) and sauce re-heating I heated up my griddle pan to med-high, salted and peppered my squid, drizzled a little olive oil on the pan, and cooked the squid for about 4 minutes per side. I will say, this dish was a success. It was a bit time-consuming trying to stuff those little sea aliens, but well worth it. They were soft, juicy, and very tasty. I would definitely make this, or something like it again. Actually, next time I think I’ll do a togarashi spiced squid and serve it with Japanese noodles in a dashi broth. The possibilities are endless! 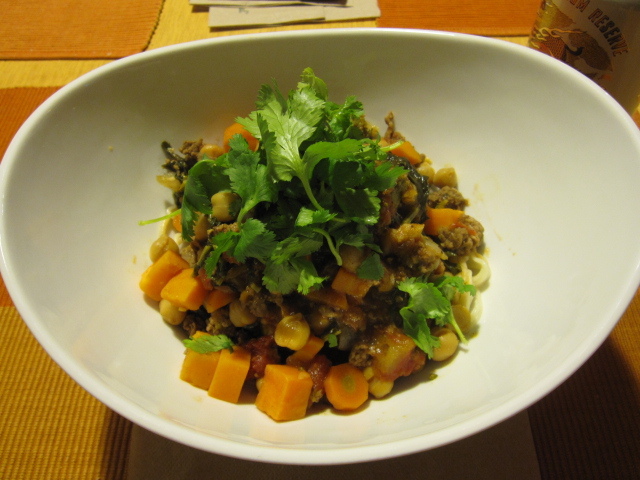 Punjabi Bolognese…sounds kind of weird, right? Well, it isn’t, its delicious! Basically, all I did was take a classic Punjabi dish called Masaledar Chholay (spicy tomato sauce with chickpeas) and add a few things, take away some of the heat, and smother some pasta with it. 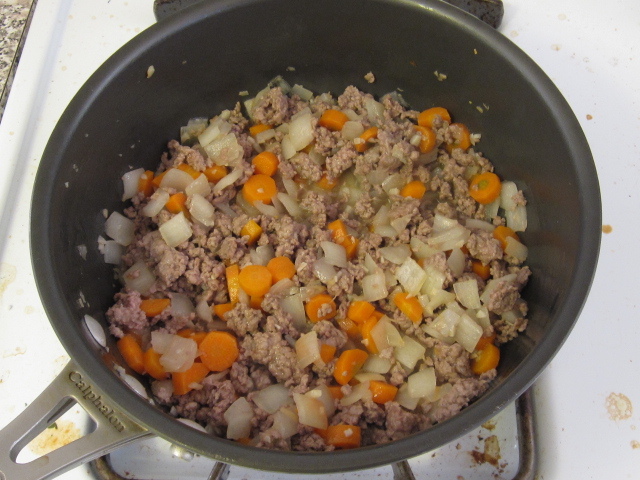 It really worked out well and is a nice change from regular bolognese. I had already started my prep when I realized that I need to take a photo. 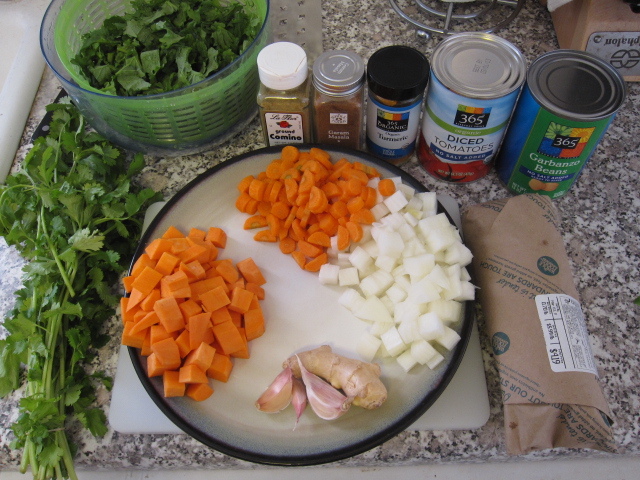 So, here are the ingredients all chopped up and ready to go. I had a handful of cilantro that I ripped up at the last minute of cooking, a bunch of rapini chopped up (not an Indian ingredient, but I thought the mustardiness would match real well, I was right of course), 1 medium sweet potato diced, 2 medium carrots diced, 1/2 onion diced, 1 inch of ginger minced, 3 garlic cloves minced, 3/4 pound of ground lamb, 1.5 tablespoons of cumin, 1 tablespoon of garam masala, 1/2 tablespoon of turmeric, 1 14oz can of diced tomatoes, and 1 14oz can of chickpeas. In a hot pan our poured in 2 tablespoons of olive oil and added the ginger and garlic. I let them go for a minute until the oil was very fragrant. Then, I added the onion and carrots. I let them sweat down for about 5 minutes before adding the lamb. It took the lamb another 5 minutes or so to cook through as I broke it up. Once cooked through I added the spices and mixed them in. With the meat spiced I poured in the tomatoes along with the juice in the can and let it come up to a slight boil. 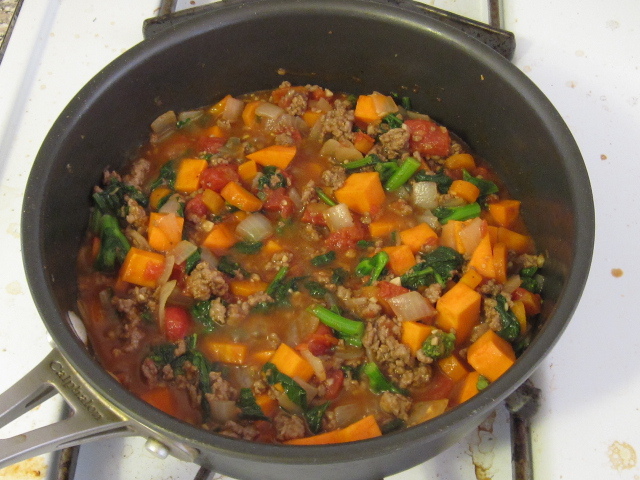 Then I added the rapini and sweet potato, stirred it all in, covered the pot, turned the heat down to med-low, and let it simmer for about 15 minutes. After that I added the chickpeas, seasoned with salt and pepper, and let it simmer for another 5 minutes or so. Since I used canned chickpeas I only needed them to heat through. While the chickpeas were heating up I boiled a mix of regular and wheat spaghetti in salt water according to package instructions. To serve I simply put the noodles in the bottom of a big bowl and ladled some of the Punjabi Bolognese on top. I garnished with the cilantro. The other night I knew I wanted to make some spaghetti of some sort, but I wasnt sure what to do with it until I came across these beautiful little scallops. We haven’t had scallops in a while so I figured I’d just make a very simple tomato sauce with them and some vegetables. 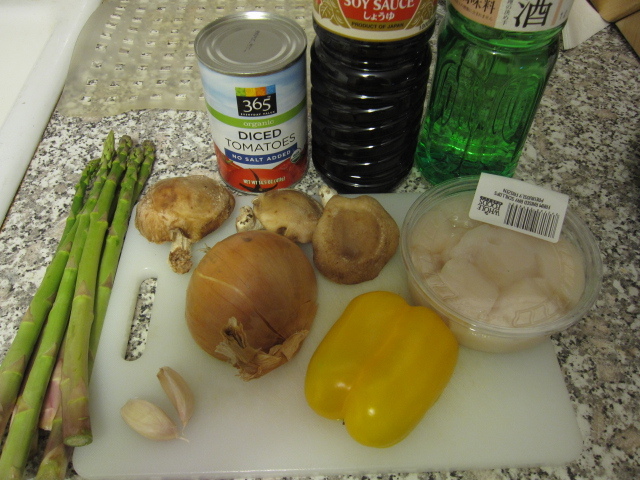 Besides about 2/3 pound of scallops I chopped up 8 asparagus, 3 shiitake, 1/2 onion, 2 cloves of garlic, 1 yellow bell pepper, opened up 1 14oz can of diced tomatoes, and got out 1 tablespoon each of soy sauce and sake just to add a little umami. This is about is simple as cooking gets. While I was boiling some salt water for the noodles, I used half angel hair and half wheat noodles, I heated up my pan and poured in about 2 tablespoons of olive oil. I sautéed the onion for about 5 minutes before adding the garlic, I let that go for another minute. After that I added the shiitake, pepper, and asparagus and let them go for another 5 minutes. I added the soy sauce and sake, let them boil off for about 1 minute, and then dumped in the tomatoes. 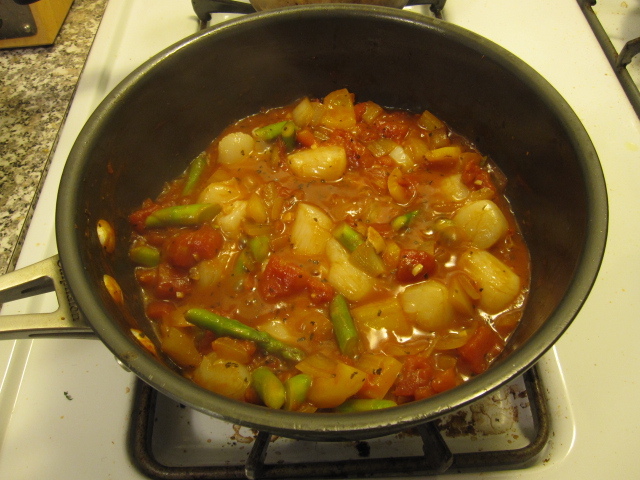 Once the tomatoes were at a low boil I turned the heat down to medium and added the scallops. 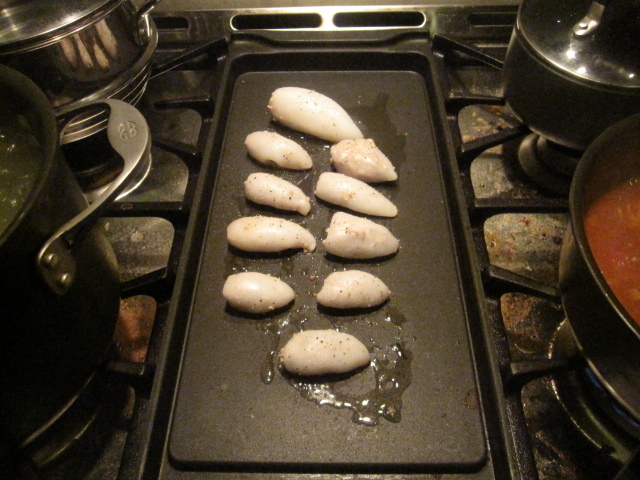 Scallops can be a little tricky here because if you overcook them they’ll become a bit rubbery. On the other hand, they do give off a lot of liquid so you need to boil some of that excess off. I let them go at a very low simmer for about 10 minutes and it worked out perfectly, but each stove top is different so you have to keep a close eye on it. At the very end of cooking I decided to add a little dried basil along with some salt and pepper. Once I drained the noodles I just ladled the sauce on top. I had some wheat dinner rolls to eat with it. This is a dish I made last week when I noticed that blue crab meat was on sale. The meat came in little sealed containers and was much fresher than canned crab meat. I thought making a spaghetti with it would be a good way to go. 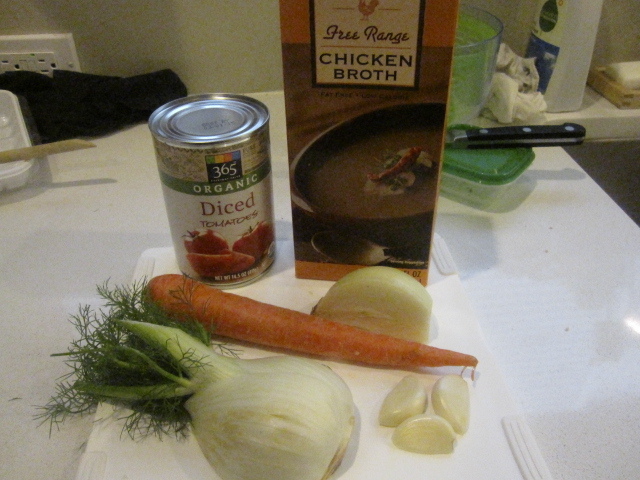 I also made a simple soup to go with it, along with some wheat bread. I made this Friday night so the recipe is only portioned for 2 servings. I made the soup first since I could just re-heat it when the spaghetti was ready. 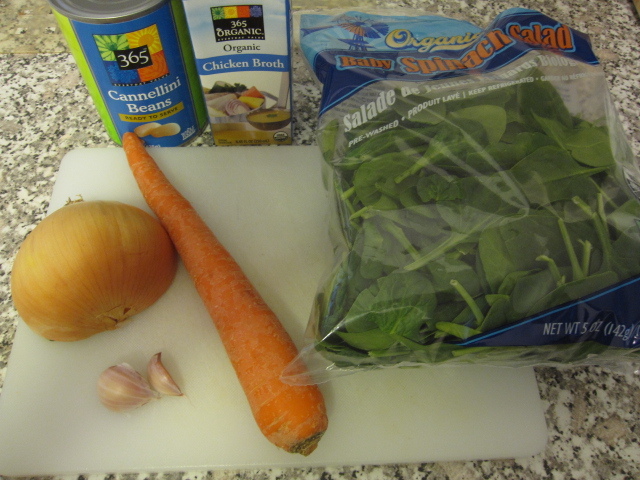 I used 1/2 an onion sliced, 2 garlic cloves chopped, 1 carrot chopped, 1 can of cannellini beans rinsed and drained, 1 cup of chicken stock, and a large handful of baby spinach. Real simple, I poured the stock in a soup pan and added the onion, carrot, and garlic. I brought it to a boil, turned the heat down, and let it simmer for about 10 minutes. 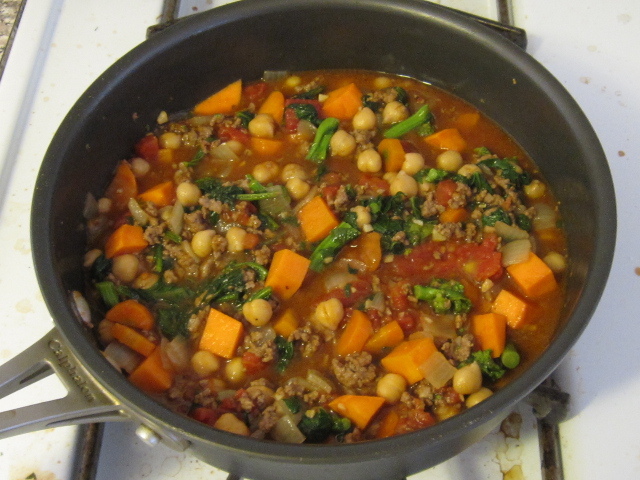 Then I added the beans and spinach and turned off the heat. 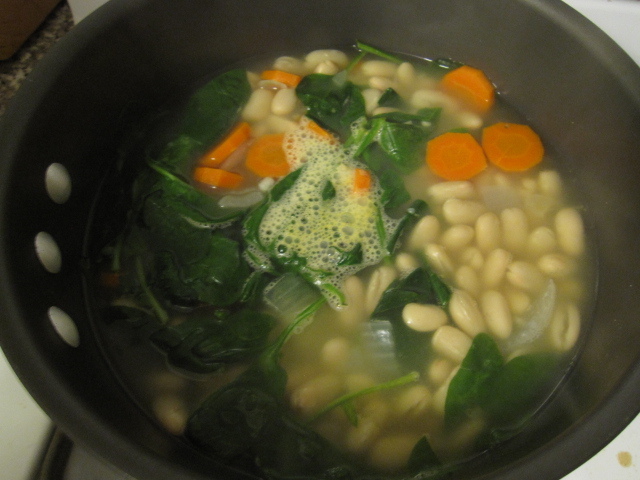 The beans and spinach don’t need to be cooked so I could just let them heat up when I re-heated the soup. Before serving I seasoned with salt and pepper. The spaghetti was real simple as well. 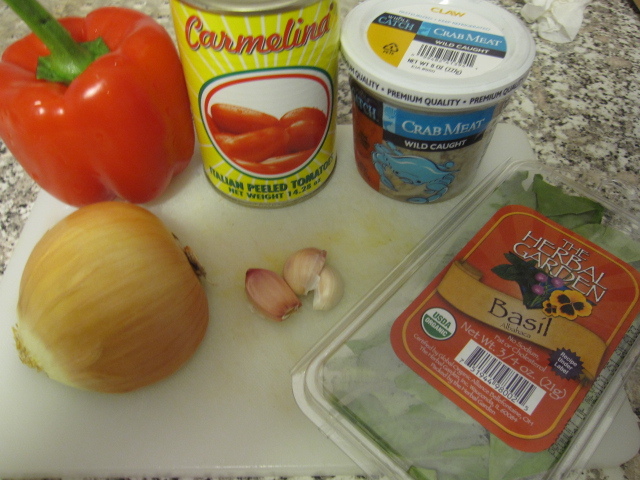 I used 1 red bell pepper chopped, 1/2 onion chopped, 1 14oz can of Italian peeled tomatoes, 1 8oz container of blue crab meat, 3 cloves of garlic chopped, and 3/4 oz of basil. 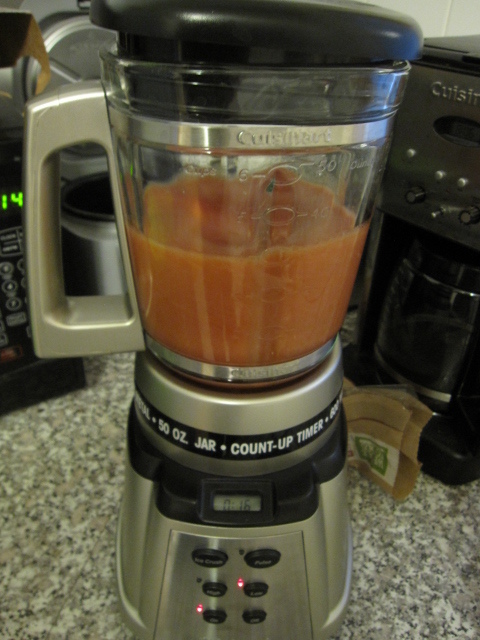 I threw the onion, tomatoes, and garlic and into my blender. 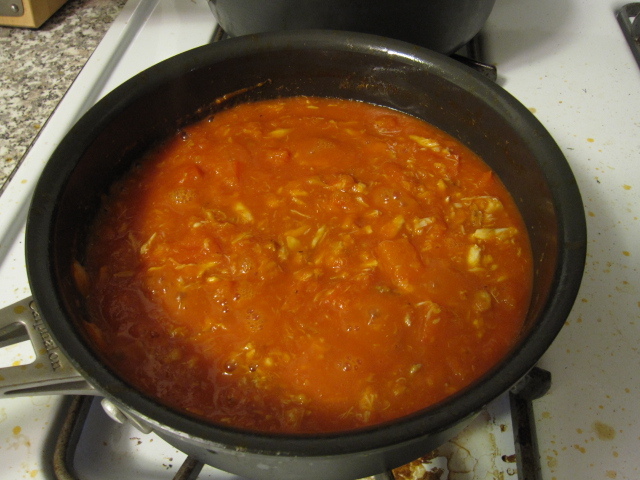 I filled the tomato can about half-way with water and added that as well along with a few red pepper flakes. I let it go until I had a smooth tomato sauce. In a pan I heated up about 1 tablespoon of olive oil and sautéed the red pepper for 5 minutes. Then I poured in the tomato sauce and let that come up to a boil. Once it started bubbling I turned the heat down and let the raw onion and garlic in it cook out for about 10 minutes. While that was going on I picked through the crab meat to make sure all of the shells had been removed and then added it to the sauce with all of its juice. 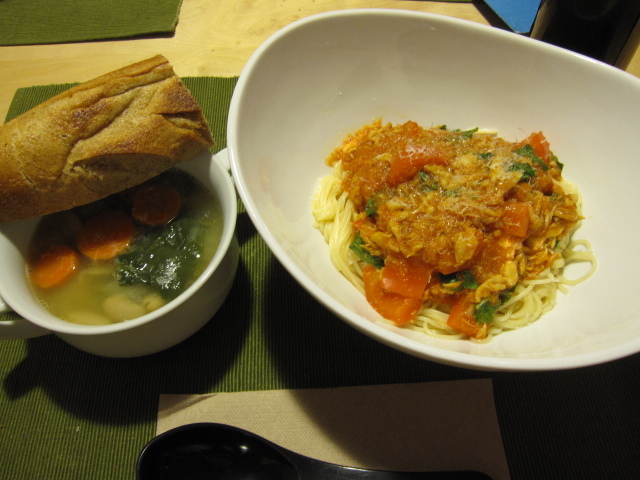 I cooked some spaghetti noodles according to package instructions, heated up the soup, seasoned the crab-tomato sauce with salt and pepper and added the basil, and then served it all up. 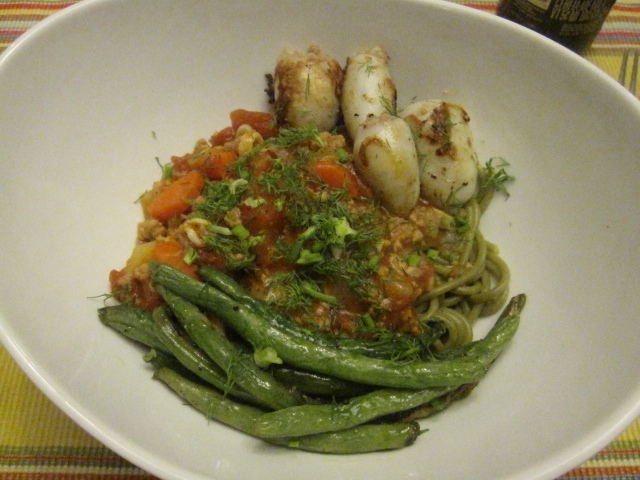 Last night I made another Japanese flavored spaghetti dish using sake hogushi and aonori. Sake hogushi is simply cooked salmon that’s been flaked into small “crumbs” and jarred. Aonori is a type of nori, Japanese algae, that’s been ground into a powder. The two ingredients can be used in a variety of ways like being sprinkled on white rice, mixed into cream sauces or dressings, or used like I did last night to name a few. Great ingredients to have on hand and available at any Asian grocer. First thing I did was get my side vegetables ready. 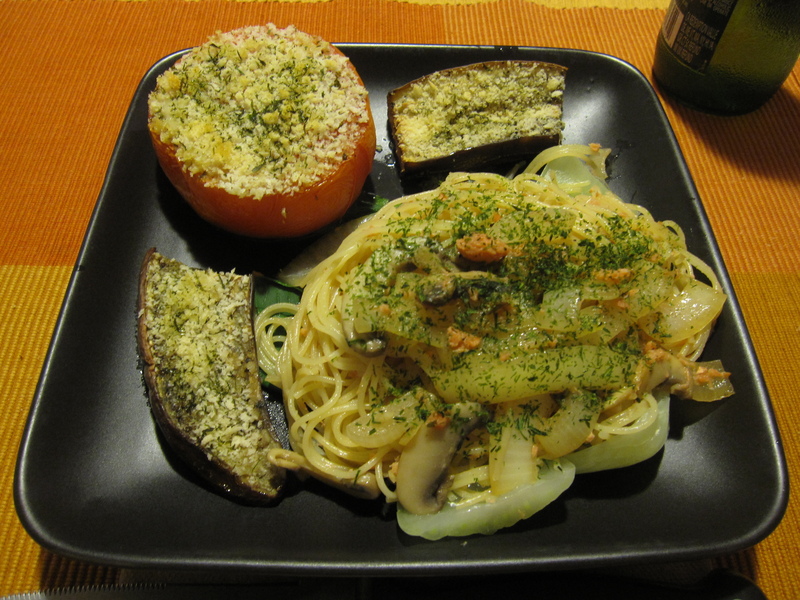 I had three beefsteak tomatoes and 1 large Japanese eggplant. I sliced the top off the tomatoes, sliced the eggplant in half length-wise, and then cut the eggplant into 2-3 inch pieces. I coated the tops of the vegetables with panko, then drizzled some olive oil on top, then sprinkled some aonori on top of that. I roasted them in a 350 degree oven for about 35-40 minutes, just enough time for me to get the rest of dinner ready. 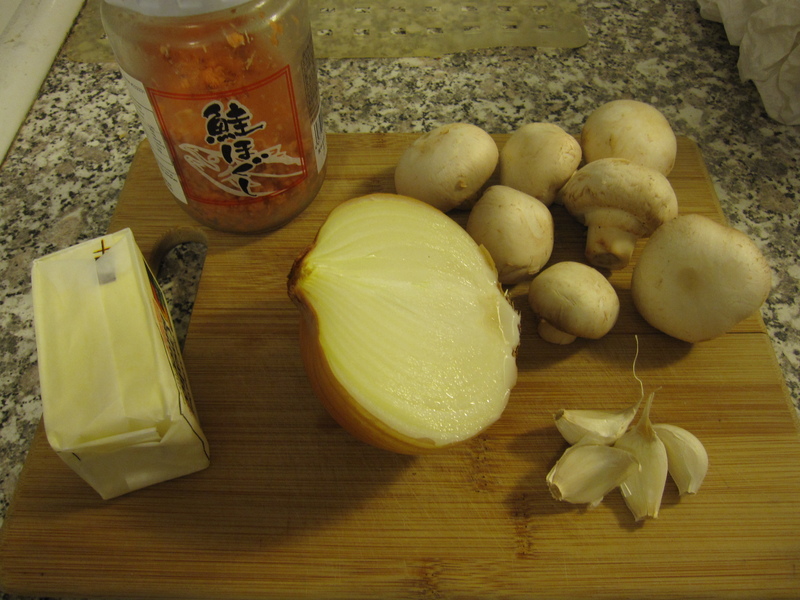 To make the spaghetti I used butter, the sake hogushi, half on onion sliced, 7 button mushrooms sliced, and 4 garlic cloves. In a large hot skillet I poured about 2 tablespoons of olive oil and then melted 1 tablespoon of butter in that. I added the onion and let it sweat for about 4 minutes. Then, I added the garlic and mushrooms. At the same time I cooked my noodles in boiling water until al dente. The garlic and mushrooms needed about 5 minutes which was about the same amount of time the noodles took. After draining the noodles (I reserved about 1/3 cup of the water) I added about 1/4 cup of soy sauce along with 1/2 cup of the sake hogushi to the onions, garlic, and mushrooms. I let the soy come to boil for about 2 minutes and then added the noodles and reserved water with some black pepper. I let the noodles coat with the sauce and most of the liquid boil off then turned off the heat and covered the skillet. 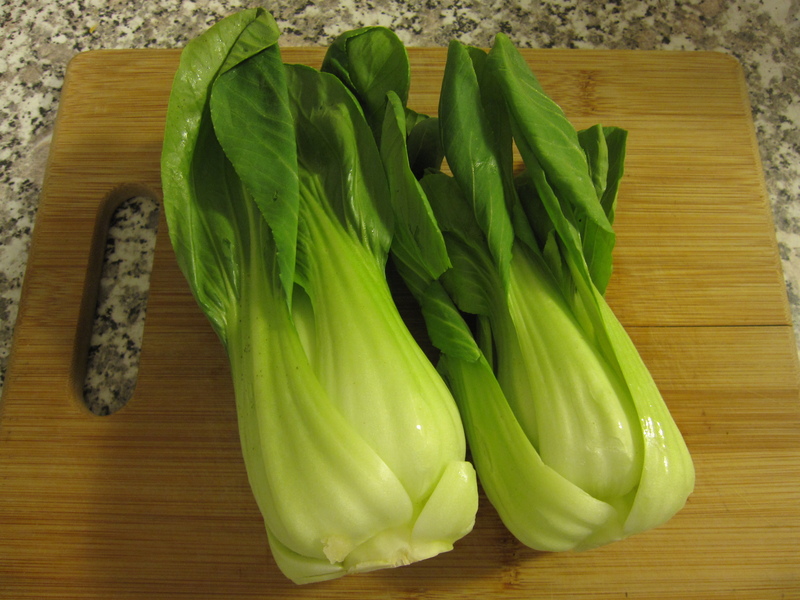 Then, I took two baby bok choy that I had seperated the leaves of and put them in my steamer for about 4 minutes. That’s just enough time to cook the stems without having the leaves wilt too much. To serve, I put the baby bok choy on the plate then the spaghetti on top of that. 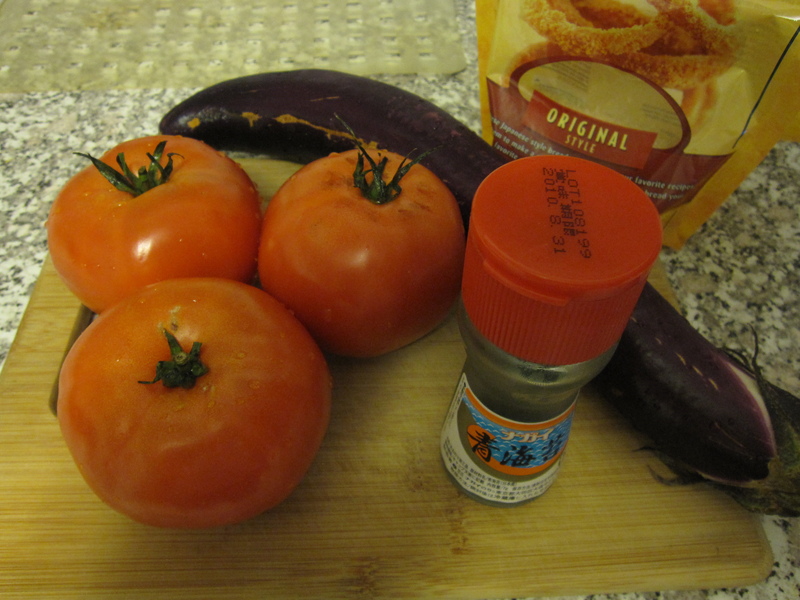 I sprinkled it with some aonori and then put a tomato and some eggplant on the side. Meatless Monday continues. I went back to my days in Egypt for last night’s dinner. In Dahab, as in many parts of Egypt, they eat a dish called Koshary as a quick lunch. It’s usually sold from street vendors as opposed to restaurants. In Dahab, my dive shop was on the far north end of the bay. The Koshary guy, much like Chicago’s ice cream bike guys, came from the north so I always got the freshest Koshary. Besides Koshary, he also sold rice pudding, but I’d usually wait and get that for dessert as it was sweeter. Koshary is a bowl filled with crazy goodness. Rice on the bottom, spaghetti noodles on top of that, lentils on top of that, all covered with spicy tomato sauce, then topped with chickpeas, and finally garnished with fried onions. All for about 30 cents ( in Egypt, it cost about $2.00 per serving last night). I didn’t make a pure Koshary though. First thing I did was dice up a medium eggplant and let it sit in a colander with some salt for about a half hour. Then I rinsed it and dried it. This takes away some of the fruit’s bitterness. After that I sauted a chopped onion in some olive oil for about 4 minutes with a few chopped garlic cloves. I ground up about a teaspoon of coriander seeds with my pestle and mortar and added that along with about a teaspoon each of cumin and cinnamon. Then I added the eggplant chunks and let them cook for about 5 more minutes. I dumped in a 28 0z can of chopped tomatoes, seasoned with salt and pepper, then let simmer over a medium heat for about 15 minutes. After that I added a can of chickpeas and let everything simmer for another 15 minutes so that the tomato juices would reduce down to a thicker stew. While the juices were reducing I friend a thinly sliced onion in extremely hot oil with some sliced garlic. The garlic burns quickly, but as long as you don’t eat it the aroma infuses the onion. You don’t want to burn the onion, but you want a nice crisp texture. Once their cooked set them aside on a small plate. To serve, instead of throwing everything in a bowl, I put the rice on the side and ladled the stew next to it. I garnished it with the fried onions and some cilantro and had a mixed green salad along side. 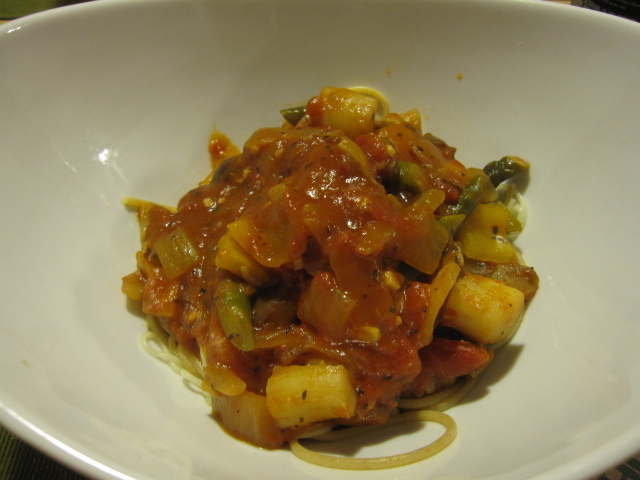 I wanted to make my own spaghetti sauce this past Monday for our meatless dinner. I was disappointed that Stanley’s didn’t have any canned tomatoes Monday morning when I went shopping for my veggies. I was going to make a mushroom ragu with basil, but those plans went out the window because I didn’t feel like cruising to any other stores just for a can of crushed tomatoes. I knew I had an unopened jar of Whole Foods Marinara sauce, so I figured I’d just doctor that up instead of running around town all morning. I diced up some onion, carrots, and cremini mushrooms then sauteed them in olive oil for about 5 minutes or so with garlic. Then I dumped half the jar of marinara and a half cup of red wine and let them come to a simmer. I tossed in some soft goat cheese and let it melt into the sauce. Seasoned to taste with salt and pepper. Turned off the heat and tossed in a bunch of fresh basil. Then I tossed it with al dente spaghetti. Easy as can be. I still had a bunch of hummus left that I had to use, so instead of garlic bread we had toast with hummus instead. It worked well since there’s a ton of garlic in my hummus. Next week’s Meatless Monday will be much more interesting. I promise.